We are on the right hand side of the street as you are heading toward the Capitol. One block past the Essen Haus and Come Back In. Look for the old Coca-Cola sign on top of the neighbor's building! 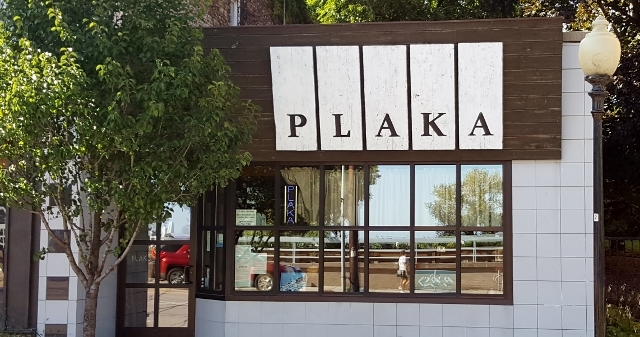 Plaka Taverna is located in the old Cleveland's Diner location at 410 E. Wilson Street. We are four blocks east of the Capitol Square, and three blocks from Monona Terrace. There is ample metered parking during the day (free after 6pm and on Sundays). Also, there is free parking on the side streets (Franklin, Hancock). In addition there is a parking lot available after 6pm, directly across the street from Plaka Taverna on the other side of the cement platform. After 6pm and all day on weekends it is free. Access this lot by turning down Hancock Street next to Rubin's Furniture.